I’ve never been a big shopper, and my inclination to shop has dropped even lower since I left the United States. But I do enjoy one type of shopping in Africa: craft-shopping. Especially craft-shopping in Swaziland. 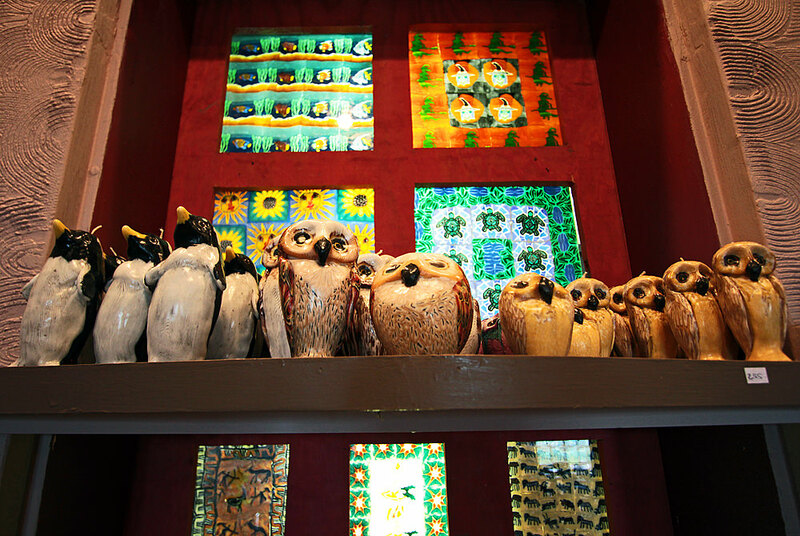 Beautifully back-lit penguin and owl candles, for sale at Swazi Candles. Swaziland is a really great place to shop for crafts. Don’t get me wrong — you can get amazing crafts all over this continent. (Check out my posts on the weaving women in Lesotho and the bead guys in Joburg.) But Swaziland is special. There are several unique craft centres there, selling locally made products at exceptionally reasonable prices. Every time I go to Swaziland, I set aside time to craft-shop. 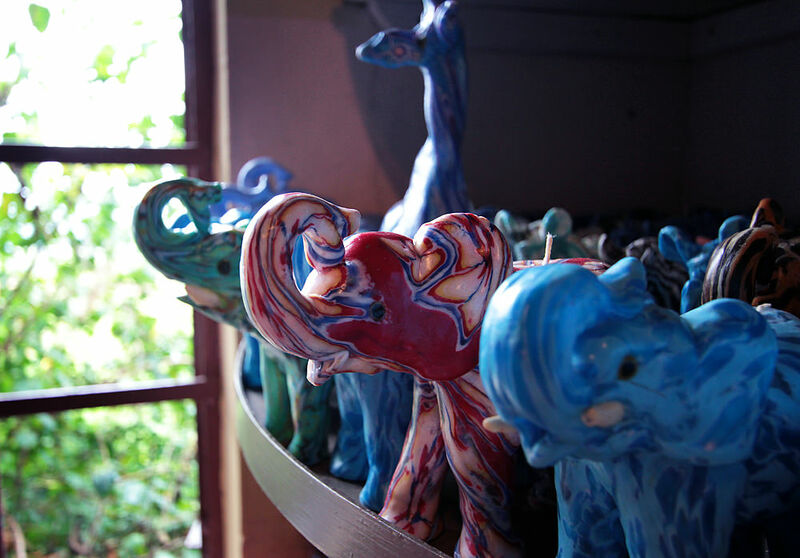 Swazi Candles is my favorite craft centre in Swaziland. I’ve managed to go there at least once on each of my four trips to the country. What I refer to as Swazi Candles is actually a mini tourist village with several shops, a cafe, and an outdoor craft market. I’m sure it has another name but I’ve always called the whole place Swazi Candles. See photos of the outdoor part of Swazi Candles in a previous 2Summers post. Elephant and giraffe candles. These are two of the most popular animals, but they make every animal you can imagine. The candles are all handmade in a workshop attached to the store. No two candles are exactly alike. Unfortunately there wasn’t much happening in the workshop on the day I was there because the power had been out for much of the afternoon. But you can read about the process on the Swazi Candles website. 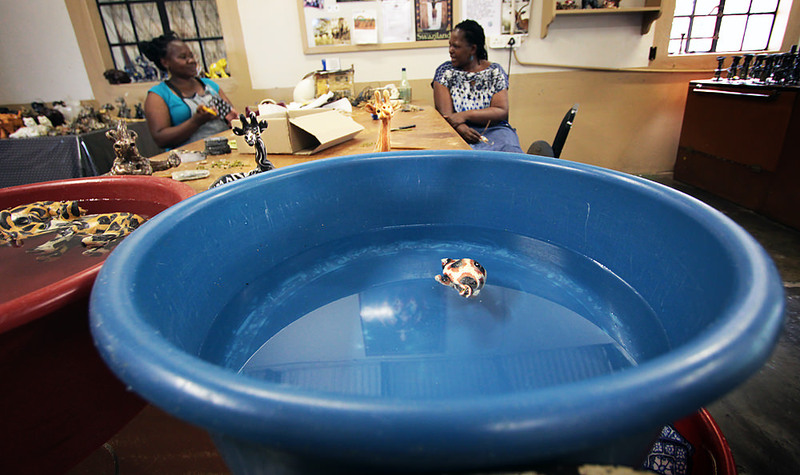 A little turtle candle cools off in the water bucket. Do you see the giraffes peeking over the side? If you go to Swazi Candles, be sure to check out the sale room in the back. You can find old or slightly flawed candles for 20-40% off. That’s where I do most of my shopping. 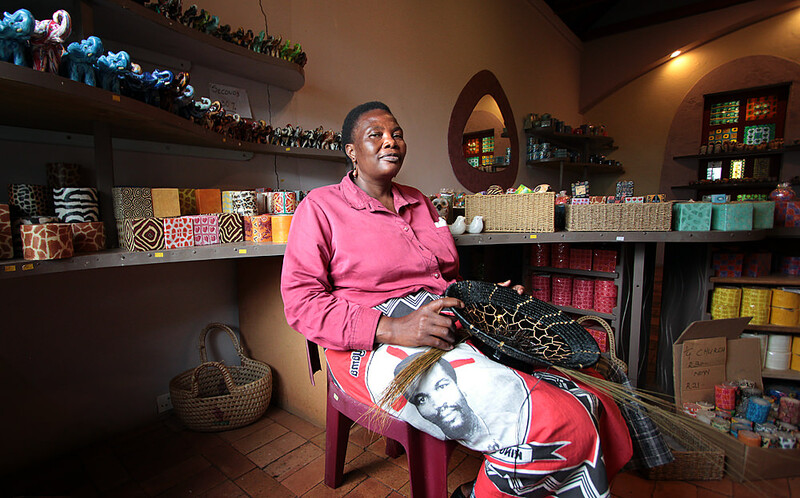 A woman weaving baskets in the back room at Swazi Candles. She actually works for Gone Rural, another Swazi craft business that I will tell you about in a minute. Note her traditional Swazi wrap with the king’s headshot on it — a very popular fashion in Swaziland. The animal candles are adorable but too pretty to burn. I usually buy a couple of the traditionally-shaped candles to burn at home. They burn slowly and glow from the inside out. Once the middle burns to the bottom you can put tea lights inside. 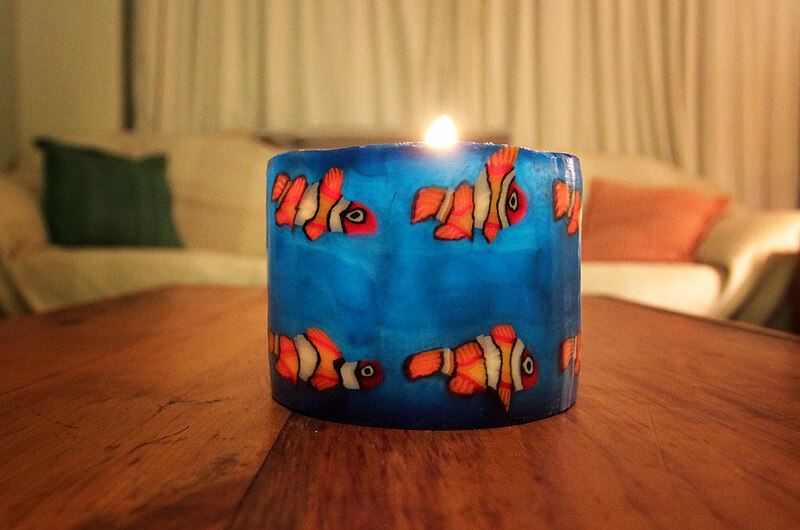 I found the best Swazi candle in the back of the bargain room — blue with orange fish. I lost my receipt, but I think it cost R30 or R40 (between $4 and $5). This is what a Swazi candle looks like once it’s been burning for a while. There are a few other shops at Swazi Candles, the nicest of which is Rosecraft. 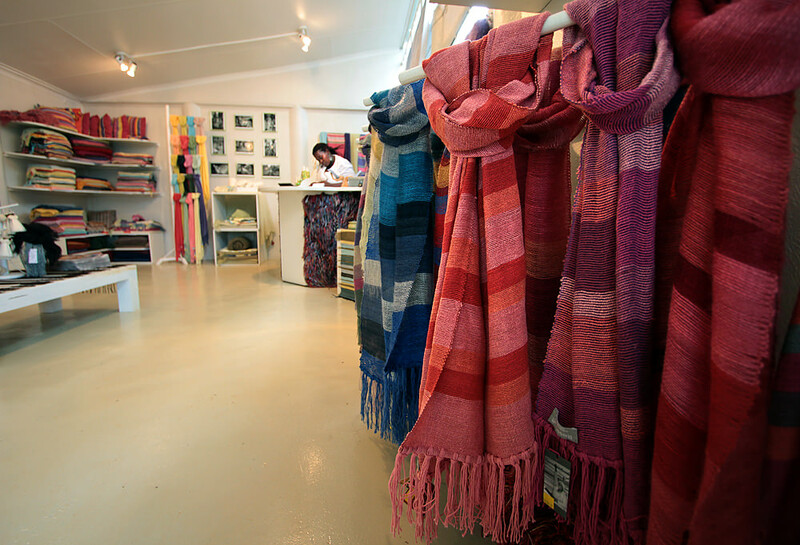 Rosecraft sells lovely scarves and other textiles made of mohair. Most of the items for sale are out of my price range, but I enjoyed looking around. I think these scarves sell for about R300 ($39). 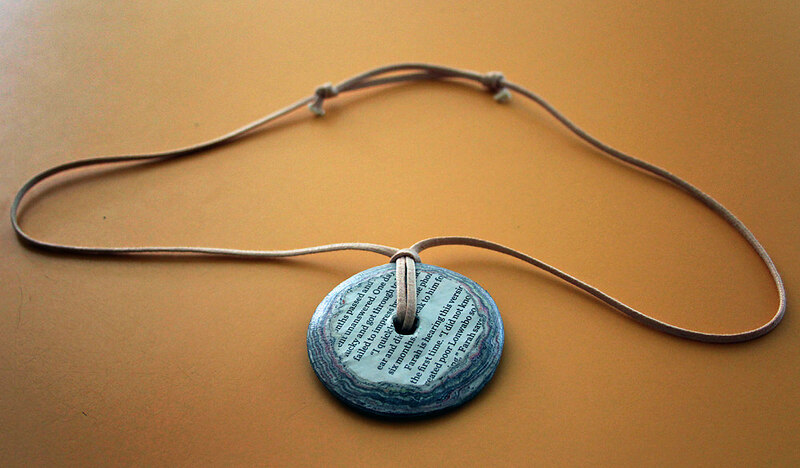 While at Rosecraft, I did break down and buy a pendant necklace made of recycled newspaper and magazines, from another Swazi company called Quazi Design. It was R90 ($12). I’m a sucker for accessories. My necklace from Quazi Design. It matches everything and can be adjusted to any length. Just up the road from Swazi Candles is a place called House on Fire. Inside the House on Fire. House on Fire defies description. Like Swazi Candles, it’s an entire village. And more. It’s a performance venue, an art gallery, a festival ground, and a night club. The property also includes a restaurant, bar, coffee shop, several craft stores, and a B&B. The whole place is straight out of a fantasy novel. 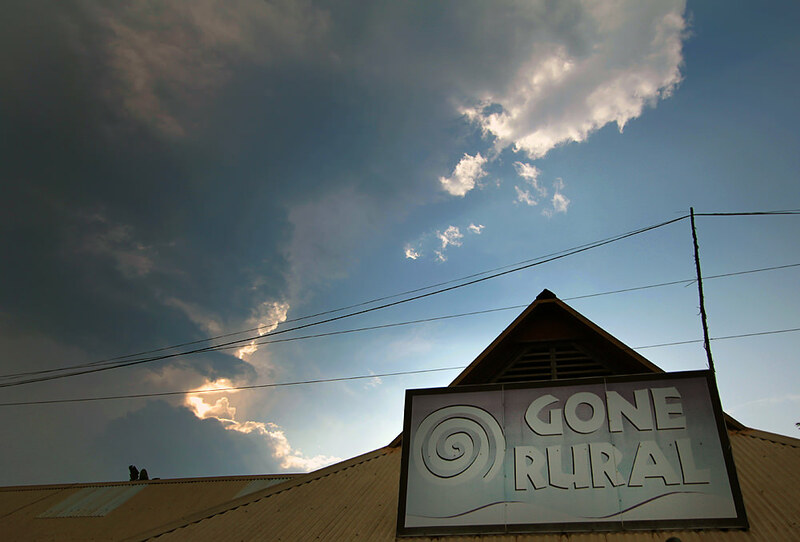 The most prominent store at House on Fire is Gone Rural, which sells locally made woven crafts. 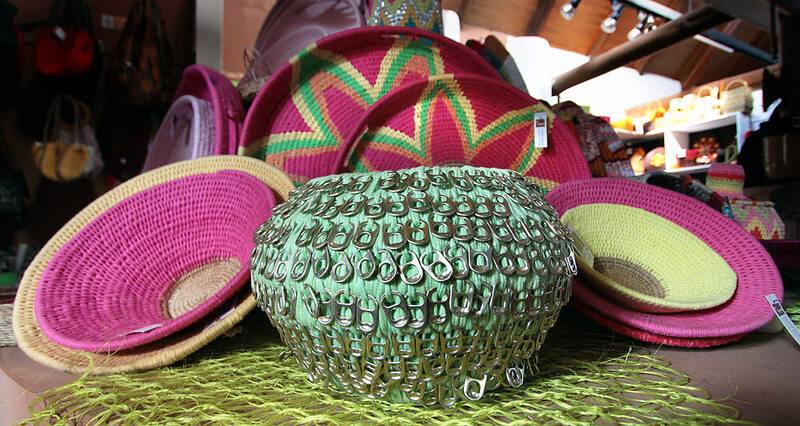 A basket made of aluminum pop-tops! 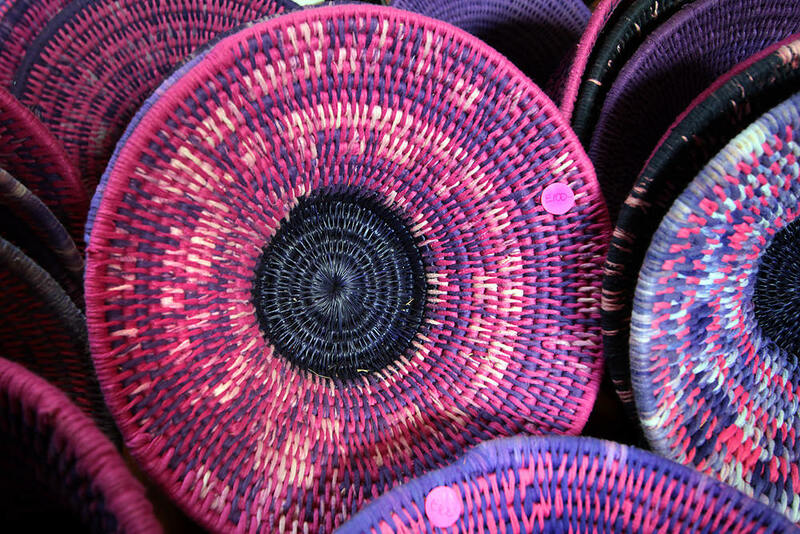 Baskets woven from grasses and fabric. This basket sells for R100 (about $13). It would sell for twice that at a shop in Joburg. So concludes my craft-shopping tour of Swaziland. The shops I’ve shown you are all in one Swazi town, called Malkerns. There are many others around the country that I haven’t visited yet. I’ve heard that Ngwenya Glass, near the main border crossing with South Africa, is particularly spectacular. Hopefully I’ll make it there on my next trip. The best thing about these shops is that they are all World Fair Trade organizations, promoting responsible commerce and supporting hard-working people in Swaziland. Swaziland is suffering from a dire economic and political climate. The majority of Swazis live in poverty, as you know from a previous post. Shopping at places like this helps make a difference. Also, the salespeople in Swazi craft shops are not pushy. You can browse to your heart’s content and never be bothered. 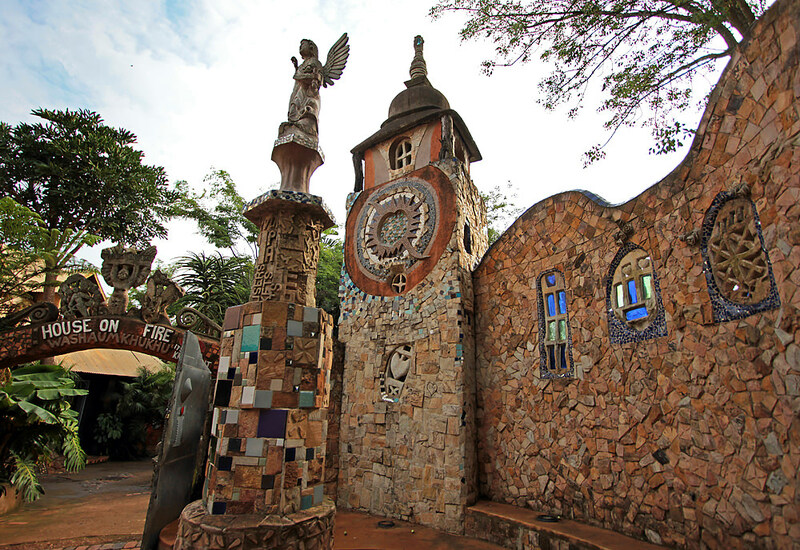 Go to Swaziland, and go crafty. I had fun looking at the websites of all the art centers you visited…the paper jewelry and hats are fascinating! Yes, so much creative stuff. With his photographs and beautiful story I seem to be traveling there. Thank you, that’s a lovely compliment! I hope you get to visit Swaziland for real someday. We have 3 participants coming to our training from the Swaziland Fair Trade association next month! Swazi craft is always impressive- they seem to effectively organize in large numbers more than in South Africa. Finally I have been to the places you visited. I love Swaziland and my favorite craft places are Swazi candles and Ngwenya glass.where you can watch them blowing glass. Awesome. Yeah, I need to get to the glass place next time! House on Fire has been on my bucketlist for a long time – need to unbucket it soon. I know, I had been feeling the same way. I had never been until this trip and it was my fourth trip to Swaziland. I loved Swazi Candles when I was there! I had trouble not buying out the place. As it was, I weighed down my suitcase with all of my purchases! I know, I can totally relate. I’ve bought so many of them over the years for my family in the States. Thank you Francis. Glad you enjoyed the journey! Thanks, I’m glad you enjoyed it! Thanks for visiting my blog. If you love Swazi craft, please spread word about a new shop that just opened in Parkhurst called Swazi Ecletic. She has a great range of Swazi craft and is on 7th between 9th and 4th! Thanks Michelle. I will definitely check it out! Yes, I’ve also heard good things about the Manzini market. I tried to go there on this trip but the timing didn’t work out. Next time, definitely. Oh yes, you’ll definitely get better prices in Swaziland. And yes, that’s also why I love Swazi crafts — they’re very different from the stuff in SA. Have a great trip!